A very sad event has prompted me to put finger to keyboard on this occasion. Wildlife Trusts, a major environmental charity that aims to “stand up and work for nature on all fronts”, announced a volunteer recruitment campaign that aims to take on 5000 people whose duties will include monitoring red squirrel population, while also trapping and bludgeoning to death grey squirrels. 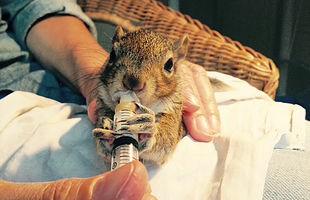 Several squirrel advocacy and rescue groups, including Urban Squirrels, have written to the Guardian, which published the initial article about this volunteer drive, and have complained to the charity itself. 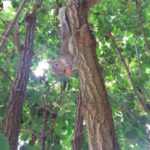 In the unlikely event of an answer from Wildlife Trusts, the arguments are bound to centre around grey squirrels not being native to this country and replacing the native red squirrel. People who like all animals (even humans, in spite of their unsustainable numbers and devastating impact on the environment) and who are reasonably informed about the issues surrounding grey squirrels, will be ready to pull out and deploy the facts, arguments and research references that prove that grey squirrels do not push out the native red, destroy trees or reduce the bird population. I have done this myself on several occasions and will continue to do so. However, in this particular battle it may not be enough. As ancient wise men used to say, for every word there is a word. We can quote research papers, Wildlife Trusts will quote others at us. We can offer one interpretation of the research, they can offer another. The argument can disappear down the proverbial echoing hall of endless academic references that lead us further and further away from the bigger picture. We certainly cannot do without these factual arguments altogether, but they may need to be supplemented by another approach. This supplementary line of argument focuses not so much on the environmental impact of grey squirrels, real or mythical, but on the manner of our whole involvement with nature. The trouble is, we play God with nature so confidently that we rarely stop to even acknowledge to ourselves that this is what we do. The red versus grey squirrel debate puts a spotlight on this tendency. Red squirrels are neither endangered nor rare in the world in general. In the UK their numbers are low, because the habitat has been either destroyed entirely or altered to such an extent that red squirrels can no longer survive there unaided. Under these circumstances, traditional conservation simply decides to artificially maintain red squirrels in habitats that are no longer suitable for them, while cruelly and continuously killing grey squirrels that try to move in. No attempt is made to form a philosophically and scientifically sound opinion on how nature works and trying to fit into this pattern. Instead, the guiding principle is, basically, the human whim. People form a sentimental idea of Merry Old England, where red squirrels play in mature oaks. They then try to recreate this sentimental paradise of their dreams. However, reality strikes. Red squirrels happen to be unable to digest acorns, they need food offered by extensive pine forests in order to survive. Their numbers crash. More adaptable grey squirrels, who can digest acorns, move in. The reaction of the sentimental dreamers? Offer a lot of supplementary feeding to the reds (spreading disease among them by not maintaining proper hygiene at the feeding stations in the process), while training volunteers to catch grey squirrels in traps, transfer them into bags and bludgeon them to death. This conservation paradigm rests on ignorance, arrogance and routine cruelty. It constitutes working against nature, rather than with it. Habitats change, some animals decline, others rise, it is a natural process. Red squirrels may be native to this country (although quite a few of them were introduced from continental Europe as well), but the environment has drastically changed. Going back to a past “golden age” is a human agenda. If humans want to pursue this agenda by benign means, it is not a problem to anyone other than the people footing the bill. If, however, they do it by non-stop brutality towards another type of squirrel – the very one that has adapted as the next step in the development of the ecosystem – it is utterly morally repugnant. The traditional native versus alien argument inevitably comes up in these discussions, but it cannot bear the weight it is expected to carry. The current “native good, alien bad” mantra is purely a question of fashion. In the 19th century the fashion was the opposite: the nature-lovers of those days encouraged acclimatization, which involved taking animals from all over the British Empire and trying to establish them on different continents. It is in this context that the grey squirrel was introduced to this country. Now the fashion is the opposite, and alien species are, as far as traditional conservation is concerned, public enemy number one. As any irrationality, this leads to exaggeration and downright falsehood. Surely there is a golden mean there somewhere. It is wrong to bring alien species in, but is it equally wrong to demonize and kill the ones that are already established here. If now we recognize the 19th century acclimatization movement as unacceptable interference with nature and as something that is very vulnerable to the law of unintended consequences, how logical is it to try to correct it with more interference with nature, in the form of killing one type of squirrel in order to help another?